Several empty cans and mats. To train the power and agility of children's lower limbs. To train the coordination of children's limbs. Lay several empty cans horizontally over the floor. Sitting on the mats, parents are to press the floor with both hands and demonstrate the way to make the laid down cans stand up by both feet. 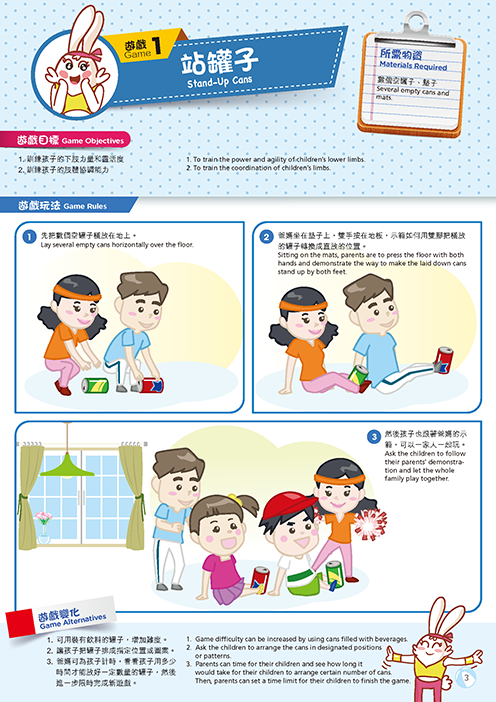 Ask the children to follow their parents' demonstration and let the whole family play together. Game difficulty can be increased by using cans filled with beverages. Ask the children to arrange the cans in designated positions or patterns. Parents can time for their children and see how long it would take for their children to arrange certain number of cans.Then, parents can set a time limit for their children to finish the game.